Total Restore is a leading physiotherapy clinic in Manchester City Centre. Our team of highly-experienced physios have a proven track record of getting clients out of physical pain quickly. Our team of physiotherapists offer a wide range of physio treatments to get you back to your best, including musculoskeletal physiotherapy, sports physiotherapy, sports massage, acupuncture and pilates. Our physiotherapist team in Manchester are all members of the Chartered Society of Physiotherapy and have many years of experience successfully treating a range of physical health conditions and injuries with physiotherapy. Our exceptional physio team will work with you on a one-on-one basis to create a tailored physiotherapy treatment programme to help you recover and regain mobility as quickly as possible. We treat a wide range of problems from sports injuries, back pain and neck pain, to whiplash, sciatica, and much more. We apply the most up to date physiotherapy and rehabilitation techniques including acupuncture, electrotherapy, ultrasound, and hands-on mobilisation and massage treatments, as well as offer group pilates classes led by our expert physios. All our physios work from our Manchester city centre physio clinic located on St Ann’s Square, just off Deansgate. We always try to offer same day appointments, so call us on 0161 833 3008 or email info@totalrestore.co.uk if you’re looking for an experienced physiotherapist in Manchester. We work with both individuals on a private basis, as well as all the major health insurers, including Axa, Bupa, Aviva, Physio First and Simply Health. When you call, just let us know what physio treatment payment options are best for you. All our Manchester physios at Total Restore are Chartered and registered with the Health Professions Council (HPC). They have gained extensive experience through working in both the NHS and private sectors. Our physiotherapists main focus is always to restore movement and function to the body following injury, illness, operation or dysfunction. Sarah, the lead physiotherapist at Total Restore, qualified as a physio in Manchester over 9 years ago. She has worked extensively across various specialities including cardiorespiratory, orthopaedics, neurology, musculoskeletal and sports injuries, in hospital, community and private clinic settings. Sarah has a strong interest in the musculoskeletal and sports injury field. She has worked as a physio at several major sporting events, including the Glasgow Commonwealth Games 2014. Sarah’s key area of physiotherapy expertise and interest lie with neck and back problems, biomechanics, postural analysis, core stability and soft tissue injuries. Sarah is a also qualified Pilates instructor through the APPI (Australian Physiotherapy and Pilates Institute) and has had experience teaching Pilates on a one to one basis and in group classes, for rehabilitation of injuries and also for general fitness and well-being. We are a leading physiotherapist in Manchester with a proven track record of using physiotherapy to help people recover from restricted mobility and pain. 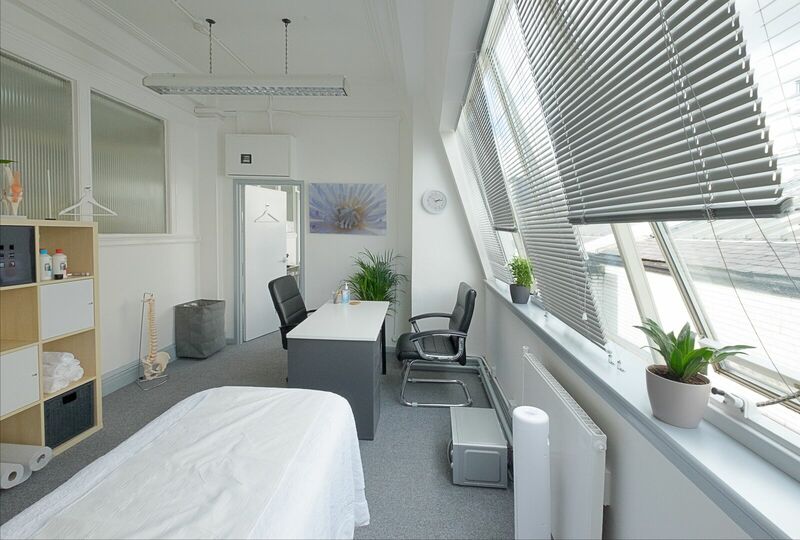 Our Manchester city centre location means that we are easy to reach for busy professionals working in Manchester or those living in the city. We can offer same-day physio appointments and treat clients with a tailored treatment plan to ensure that the recovery process is as quick as possible. Our pricing is extremely competitive and we also work with some of the main insurance providers. Your body is complex. Musculo-skeletal physiotherapy looks at all the aspects of your condition to best assess your treatment. If you’ve been injured as a result of a sporting problem, speak to us today to help you get back to doing the sport you love. Bookings and enquiries are handled by our Physiotherapists so that if necessary you can have a chat directly with a treating practitioner. Pilates come with numerous benefits for your entire body, whether you have any health problems or many other different reasons.